Tall women don't just live in the U.S, which means that you can find fashionable tall women clothes in stores around the world. Just take a look at the variety of clothing from countries including the U.K., Australia, Canada, and France, among others. While shopping, be sure to check shipping policies to make sure the store ships to your country and location. Dorothy Perkins - $ | 36" inseam | Jeans, pants, and trousers in 91 cm inseams (approximately 36" inseams). Also offers tall women clothes such as tops, dresses, and maternity. See the Tall Clothing section. Shop online or at retail locations. Land's End - $ | up to 36" inseam | Classic, casual style. Jeans and pants in up to 36" inseams. Free cuffing and hemming available on select items. Also offers tall ladies sizes in tops and swimwear. Select Tall option in Size Range drop-down menu in Women's section. Extended sizes available for tall women clothes. Long Tall Sally - $$ | up to 38" inseam | Specializes in clothes for tall women. Tall jeans and pants in 34" to 38" inseams. Also offers women's tall clothing such as tops, sweaters, dresses, skirts, suits, coats, activewear, sleepwear, swimwear, and maternity. Extended sizes available for tall women clothes. Shop online or at retail locations. My Tights - $ | Long Inseam | Carries tall and extra tall classic and fashion hosiery for women up to 6'5", according to the size guide. New Look - $ | 35" inseam | Long jeans and pants in 35" inseams. Also offers tall women clothes such as tops, dresses, skirts, and jackets. Select Tall under the Women's section. Shop online or at retail locations. Next - $ | 35" inseam | Tall size jeans, pants, and trousers in 35" inseams. Also carries tall tops, dress shirts, sweaters, dresses, skirts, jackets, businesswear, activewear, and sleepwear. Select Tall under the Women's section. Tall and All - $$ | up to 40" inseam | Specializes in clothes for tall women. Carries tall jeans, pants, and trousers in 35" to 40" inseams and in a wide range of designs and styles. Also sells girl's tall clothing such as tops, dresses, skirts, jackets, pajamas, and activewear as well as more unique items including jumpsuits, clubwear, and clothes in bright colors and graphics. Plus sizes available for tall women clothes. Offers a custom made service for a custom fit based on your measurements. Or, design your own styles for their specialists to construct. Top Shop - $$ | up to 36" inseam | Trendy collections. Long length jeans in 36" inseams. Trousers and leggings in 35" inseams. Also carries women's tall clothing such as tops, dresses, skirts, and jackets. See the Tall section. Shop online or at retail locations. 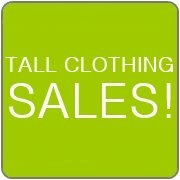 Xtralength - $$$ | up to 39" inseam | Specializes in clothes for tall women. Extra long length jeans and pants (dress, casual, and active) in up to 39" inseams. Also carries tall dresses and a small selection of sleepwear and maternity wear. The majority of the following stores do not have websites in English. However, they are known to carry tall ladies clothing, so I didn't want to leave them out. I've, also, included shops which offer websites for a number of different countries and languages. Be sure to choose your specific country once on the site.